Some of you may remember when I first started this comic I had two other webcomics going. I was pressed for time and also extremely poor. So I started this comic on a donation model so I could cover my server costs and be able to financially justify the time it would take to add a third comic. I’d since gotten a better job and donations slowed way down so I stopped doing that and just started updating the comic weekly. Problem is, the site isn’t paying for itself anymore, and I’d love to transition into spending more time doing comics and less on my day job. So donations are back on! Sin Pararse will still update every Friday but for every $100 the site takes in in donations we’ll have two pages that week! The extra page will most likely go up on Saturday, or the following Monday at the very latest. Any amount is acceptable, though bear in mind that for very small amounts Paypal takes a big bite out of it. 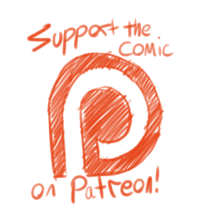 If you’re curious you can use this calculator to figure out how much of your donation will go to Paypal and how much will go to me.Donators who send $10 or more will be thanked by name in the author comments on the extra pages. If you’d liked to be thanked as someone other than the name on your paypal account please let me know when you send the donation. Alternatively, if you would like to not be thanked, let me know and I’ll leave your name off the list. If you have any questions please leave them in the comments on this post and I will make a little mini-FAQ here.